Ono Cuisine mixes flavors and aromas, making each moment a unique memory, exalting delicious and healthy flavors, immortalizing feelings through food. A unique flavor experience does not begin in the kitchen: we pick our seasonal organic ingredients from national producers with whom we have a close relationship, and from our garden as well, guaranteeing freshness and an exquisite flavor. Everyone will emotionally remember your wedding, birthday or corporate event, because we design every detail for you to live a unique experience. 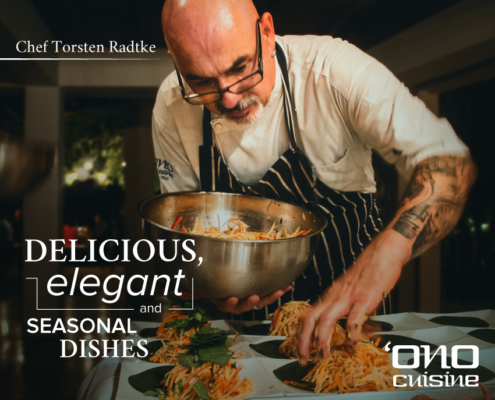 If you would like to make a reservation or have any questions, please contact us directly through our website or at info@onocuisine.com. We will answer you as soon as possible. If your event is between November and May, we recommend you coordinate the requested services as early as possible in advance, since our summer is the busiest time of the year.